I know I have said this before, but food has magical powers – that is until there is a force that breaks those powers. I haven’t seen it happen very often, but it does. Why is it so important when you go to a all day meeting that there is good food to eat? That’s because often, it puts you in a better mood. You come back from lunch refreshed and ready to tackle anything – only then to look forward to snack time. 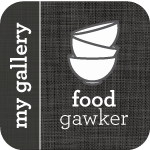 Normally my meetings have nothing to do with food – which is why it is such a treat every year to attend the Food Blogger’s conference. Not only do you talk about food, listen to other people lecture about food – there is food EVERYWHERE. It is quite something. This year things were just a little different though. The conference started on a Friday night – with a wonderful reception and the gift suite. I brought home lots of great stuff to share with the family – snacks and treats galore – but I wasn’t staying at the hotel. The next day they started us out with breakfast sponsored by Noosa Yoghurt. Now, if you haven’t had Noosa Yoghurt yet, you are truly missing out. I have been eating it for months now, and it is leaps and bounds better than any yoghurt I have ever had in the United States – it is closer to the wonderful yoghurt I can find in Europe. So, needless to say, I was in my glory. They had tons of toppings out for us so I went to town – and that pumpkin yogurt was just like eating pumpkin pie filling. I was ready to sit and listen to people talk about food for hours. That brings me back to these muffins. My daughter loves muffins in the morning because they are quick and easy. I have a different rational. I can eat a couple of hard boiled eggs for my first breakfast, then have a muffin for my mid-morning snack. Boy is life good when that happens. Magic. 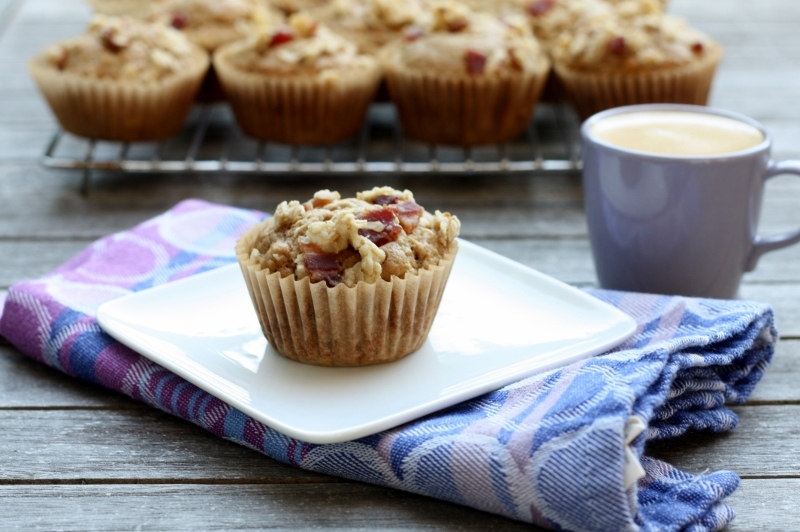 Fortunately for me, my daughter’s did not like these muffins from Cooking Light – but my husband and I LOVED them – they were mildly sweet with a touch of bacon on top. OMG. And I used margarine instead of butter, so they were dairy-free. Now, if only I could just snap my hands and make those muffins appear…now that would be magic. Preheat oven to 400°. Line a baking sheet with foil; place a wire rack on the baking sheet. To prepare streusel, combine 3 tablespoons sugar, 2 teaspoons water, and pepper in a small bowl. Spread mixture evenly over both sides of bacon. Place coated bacon on rack; bake for 18 minutes or until done. Cool; finely chop. Combine oats and 1 tablespoon flour in a small bowl. Stir in butter. Stir in 2 tablespoons chopped bacon; reserve remaining bacon. Set aside. Reduce oven temperature to 350°. Line 12 muffin cups with paper liners. To prepare muffins, weigh or lightly spoon 7.9 ounces (about 1 3/4 cups) flour into dry measuring cups; level with a knife. Combine 7.9 ounces flour, remaining bacon, 1/2 cup sugar, baking powder, salt, and baking soda in a large bowl; stir well. Combine beer, oil, vanilla, and egg in another bowl, gently stirring with a whisk. Add beer mixture to flour mixture, stirring just until combined. Evenly divide batter among muffin cups. Sprinkle streusel evenly over batter. Bake at 350° for 18 minutes or until a wooden pick inserted in the center of muffins comes out clean. Cool in pan 5 minutes. Remove muffins from pan; serve warm, or cool completely on a wire rack. These sound delish- no idea why your daughter wouldn’t have liked them! Although, as you said, that means more for you! Oh my gosh! I would love these! I’m pretty sure Mr. N would too. Not so sure about Miss A, but you just never know. I’m drooling just thinking about these. What a great combo of flavors Dawn! I can only imagine if your in a food blogger conference all about food, talking about it, seeing photos it has to make you hungry. These muffins withe sweet and savory sound delicious.